"Queen's Speech" redirects here. For the UK ceremony at which the Queen's Speech takes place, see State Opening of Parliament. For the Christmas Day broadcast, see Royal Christmas Message. A speech from the throne (or throne speech) is an event in certain monarchies in which the reigning sovereign, or a representative thereof, reads a prepared speech to members of the nation's legislature when a session is opened, outlining the government's agenda and focus for the forthcoming session; or in some cases, closed. When a session is opened, the address sets forth the government's priorities with respect to its legislative agenda, for which the cooperation of the legislature is sought. The speech is often accompanied with formal ceremony and is often held annually, although in some places it may occur more or less frequently, whenever a new session of the legislature is opened. Historically, when monarchs exercised personal influence and overall decision-making in government, a speech from the throne would outline the policies and objectives of the monarch; as such the speech was usually prepared by the monarch's advisers, but the monarch supervised the drafting of the speech at least to some extent and exercised final discretion as to its content. In constitutional monarchies today, whether by law or by convention, the head of state (or representative thereof) reads the speech from the throne, but it is prepared by the ministers in cabinet. The United Kingdom, the Netherlands, and Norway are the only contemporary European monarchies in which the practice of the country's monarch giving a "throne speech" is still observed. In other nations, the monarch may attend or still officially open the country's legislature and may also give a speech but these speeches differ from the traditional throne speech in that they do not outline any government agenda. Many republics have adopted a similar practice in which the head of state, often a president, addresses the legislature; for example, in the United States, the president makes an annual State of the Union address and in the Philippines, the president also makes an annual State of the Nation Address. Of contemporary European monarchies today: the United Kingdom, the Netherlands (Prince's Day), and Norway, still practice the traditional "throne speech" given by the monarch, outlining the government's agenda, with similar ceremonial. In other countries the monarch may or may not attend the opening of the country's legislature and may also give a speech though these speeches would differ from the traditional throne speech in that they do not outline any government agenda. In the United Kingdom, the speech is known as Her Majesty's Most Gracious Speech, the Gracious Address, or, less formally, the Queen's Speech (or King's Speech, when the reigning monarch is male). In Canada, it is known as the Speech from the Throne (often shortened to Throne Speech) (in French: Discours du Trône). Since 1973, the Lieutenant Governor of Quebec has delivered a short inaugural address termed the Allocution, after which the premier reads his or her Discours d'ouverture (Opening Speech), called the Message inaugural from 1974 to 1984. In Australia, this speech is called the Governor's speech or opening speech. In Hong Kong, the governor's address was termed the Policy Address during Chris Patten's governorship. In the Irish Free State, the governor-general delivered the Governor-General's Address to Dáil Éireann; only two were ever given, in 1922 and 1923. In the Commonwealth realms, the Speech From the Throne is an oration that forms part of a ceremony marking the opening of parliament. Some records indicate the ceremony has taken place since the Medieval era, while others place its origins in the 16th century, when England was an absolute monarchy. The speech explained to parliament the reasons it was summoned and sometimes set out the sovereign's policies and objectives. The monarch would sometimes speak to parliament in person; King Edward III (in 1365), Richard II, and Edward IV (to both houses of parliament on multiple separate occasions) did so. However, various other figures gave the oration on the sovereign's behalf: between 1347 and 1363, it was read by the Chief Justice; by the Chief Justice of the Common Pleas in 1401; the Archbishop of Canterbury in 1344, 1368, 1377 (speaking for a presiding Edward III), 1399, and 1422; and in 1343, 1363, and, usually after 1368, by the Lord Chancellor—who was then the Prolocutor, or chairman of the House of Lords. It was given on his behalf by the Bishop of Winchester in 1410; in 1453 and 1467, the Bishop of Lincoln; the Bishop of Rochester in 1472; and the Keeper of the Privy Seal in 1431. It may have been written by or with the input of the king or queen's advisers, but, the monarch, as supreme governor, was the principal author. Today, within the tenets of constitutional monarchy, the speech is written by the sitting cabinet, with or without the reader's participation, and outlines the legislative programme for the new parliamentary session. 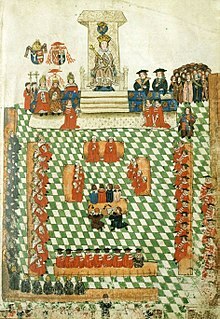 Due to the parliamentary tradition of the sovereign being barred from the lower chamber, in those realms possessing a bicameral parliament, the ceremony takes place in the legislature's upper chamber, with members of both houses in attendance. In unicameral parliaments, the speech is read in the one legislative chamber. Unusually, in the Irish Free State, the speech was delivered in the lower house of its bicameral parliament. In the United Kingdom, the speech is typically read by the reigning sovereign at the State Opening of Parliament. Traditions surrounding the Opening and the speech go back to the 16th century; the present ceremony dates from 1852, when the Palace of Westminster was rebuilt after the 1834 fire. The ceremony now occurs annually in May (prior to the Fixed-term Parliaments Act 2011 it was usually in November or December) or soon after a general election. The monarch may, however, appoint a delegate to perform the task in his or her place; Queen Elizabeth II did this in 1959 and 1963, when she was pregnant with Prince Andrew and Prince Edward respectively, the Lord Chancellor delivering the address instead. In those countries that share with the UK the same person as their respective sovereign, the Speech From the Throne will usually be read on the monarch's behalf by his or her viceroy, the governor-general, although the monarch may deliver the address in person: Queen Elizabeth II read the Throne Speech in the Parliament of New Zealand in 1954, the Parliament of Australia in 1954 and 1974, and the Parliament of Canada in 1957 and 1977. Another member of the Royal Family may also perform this duty, such as when, on 1 September 1919, Prince Edward, Prince of Wales (later King Edward VIII), read the Speech From the Throne in the Canadian parliament. On two occasions, the Administrator of the Government delivered the address to the Parliament of Canada: 16 May 1963 and 30 September 1974. In the Australian states, the relevant governor reads the speech, though, the Australian monarch may also perform the task: Queen Elizabeth II opened the parliaments of some of the Australian states in 1954 and of New South Wales in 1992. In almost all the Canadian provinces, the relevant lieutenant governor delivers the speech; it is uncertain whether the Canadian monarch can do the same in any legislature of a Canadian province. In Quebec, however, the speech is referred to as the "Opening Address" (French: Allocution d'ouverture). In British overseas territories that have instituted this practice, the relevant governor delivers the speech. A throne speech is not typical in the devolved legislatures within the United Kingdom, the nearest equivalent being a statement of the legislative agenda of the executive branch usually given by a first minister. However, the British monarch often undertakes visits and speaks to the devolved bodies in a less official capacity. So far, Queen Elizabeth II has been present and has given an address at all openings of the Scottish parliament, usually speaking reflectively upon its accomplishments and wishing the institution well for its coming term rather than considering the plans of the executive. In each of the Canadian territories, the commissioner reads the Throne Speech or Opening Address to the legislature. It is considered improper for the audience, including members of parliament, to show support or disapproval for any content of the speech while it is being read, as such is reserved to the debate and vote that follows in legislative chambers or chamber. Protest, though, has been expressed during a throne speech, such as when, in 2011, Brigette DePape, a page in the Canadian Senate, interrupted Governor General David Johnston's reading of the Speech From the Throne by standing and holding a sign calling for the then Prime Minister, Stephen Harper, to be stopped. Formally, the motion that follows the speech merely calls on parliament to thank the monarch or viceroy via an Address in Reply. The debate is, however, often wide-ranging, exploring many aspects of the government's proposed policies, and spread over several days. When the Address in Reply is eventually voted on, the poll is held to constitute a motion of confidence in the government, which, if lost, would result in the end of that government's mandate. In some legislatures, this discussion and vote is preceded by a symbolic raising of other matters, designed to highlight the independence of parliament from the Crown; a practice that originated after King Charles I was tried and executed by parliament. In the British House of Commons, the other business raised is by tradition the Outlawries Bill, while the House of Lords reads the Select Vestries Bill; neither proceeds past the first reading. In the House of Commons of Canada, the bill considered is Bill C-1, an Act Respecting the Administration of Oaths of Office, while in the Senate, it is Bill S-1, an Act Relating to Railways. The texts of these two bills have nothing to do with either oaths of office or railways; instead, they contain near-identical wordings that explain their pro forma function. In Australia and New Zealand, by contrast, no pro forma bills are introduced; there, the respective houses of representatives instead consider some brief and non-controversial business items before debating the Address in Reply. In the Netherlands, the speech from the throne is held annually on the third Tuesday in September, which is called Prinsjesdag (Prince's Day). Article 65 of the constitution states that "A statement of the policy to be pursued by the Government is given by or on behalf of the King before a joint session of the two Houses of the States General that is held every year on the third Tuesday in September or on such earlier date as may be prescribed by Act of Parliament." The monarch travels from Noordeinde Palace by Golden Coach to the Ridderzaal (Hall of Knights) in the Binnenhof of The Hague to read the speech before a joint session of the States General. Following the speech, the president of the joint session calls out ‘Long live the King!’ after which the monarch is greeted with three cheers. The monarch and his retinue leave and the joint session is declared to be closed. The monarch returns to the palace in the coach and, along with other members of the royal house, appears on the palace balcony. Following the 1983 revision of the constitution, a parliamentary session changed from lasting a year to lasting for four years. As a result, the speech no longer marks the opening of a session of parliament but the start of a new parliamentary year. In Norway, the monarch is required by article 74 of the constitution to preside over the opening of a session of the Storting after it had been declared to be legally constituted by the president of the Storting and is given every October. The monarch delivers the speech before parliamentarians in the chamber of the Storting. The heir to the throne also regularly accompanies the monarch. Upon the monarch's arrival in the chamber, the members of the Storting stand and the first verse of the royal anthem, Kongesangen, is sung. The monarch is handed the speech by the prime minister who delivers the speech while all remain standing. Afterwards, the monarch and members take their seats and the Report on the State of the Realm, an account of the government achievement of the past year, is read (traditionally in Nynorsk), customarily by the youngest member of the government present. The members and monarch rise and the monarch is presented with the report by the prime minister and the monarch returns the speech and report to the president. The president gives some remarks and closes with "May God preserve our King and country", joined by other members of the Storting and the first verse of the national anthem is then sung. After the monarch and his retinue have left, the meeting is adjourned and the speech and report are first debated at the subsequent sitting. King Alfonso XIII addressing the Spanish Cortes Generales. In Sweden, the practice of having a speech from the throne given by the monarch was held until 1974, coinciding with the amendment of the constitution of Sweden that removed formal involvement of the monarch in the legislative process. 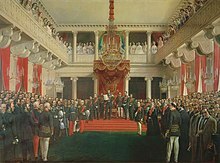 The old opening of state was in Sweden called Riksdagens högtidliga öppnande ("The solemn opening of the Riksdag") and was, as the British, full of symbolism. The speech was given before the Riksdag in the Hall of State of the royal palace. The monarch would be seated on the Silver Throne as he gave his speech. Prior to 1907, the monarch and his sons would also wear their royal and princely robes and their crowns and coronets. After Oscar II's death, his successor, Gustav V was not crowned, and thus did not wear the crown when opening the Riksdag. Instead, the crown and sceptre would be placed on cushions beside the throne and the robe would be draped on the throne. After the abolition of the old opening of state, the opening is now held in the Riksdag but in the presence of the monarch and his family. It is still the monarch who officially opens parliament but he no longer gives a "speech from the throne"; the monarch gives an introductory speech and declares the Riksdag open. After the speech, the Prime Minister's statement of government agenda (Regeringsförklaringen) for the forthcoming legislative year is made. 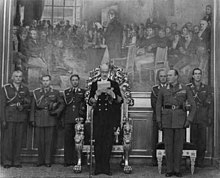 In Spain, speeches from the throne used to be practiced before the declaration of the Second Spanish Republic in 1931. With the restoration of the Spanish monarchy in 1975, the monarch still opens parliament but no longer gives a "speech from the throne". The monarch gives a speech but the speech does not focus or direct government policy. In Japan, the Emperor makes only a short speech of greeting during the Diet opening ceremony; he does not refer to any government policies, instead allowing the prime minister to address political matters, as is the current case with Sweden. In Thailand, the monarch makes a speech at a joint session in the Ananta Samakhom Throne Hall, advising the National Assembly in their work. Malaysia also has the same practice, with the Yang di-Pertuan Agong making such an address to the Parliament of Malaysia in joint session during its state opening yearly every March. Many republics also hold a yearly event in which the president gives a speech to a joint session of the legislature, such as the State of the Union address given by the President of the United States. (In most US states, the governor gives a similar State of the State address.) Similarly, the President of the Philippines gives the State of the Nation Address. Often such are on or near the first day of the legislature's new session. However in theory, rather than just outline the priorities for the coming year, the head of state is supposed to provide a report to the legislature on what the country's condition is, hence the term State of the Nation. ^ a b "What is the Queen's Speech?". BBC. 3 December 2008. Retrieved 14 August 2008. ^ "What You Need to Know About the Queen's Speech". Sky News. 27 May 2015. Retrieved 20 September 2015. ^ Bright, James Franck (1885). A History of England: Period II. Personal monarchy: Henry VII. to James II. 1485–1688. Princeton University: Dutton. p. 594. Retrieved 2 November 2015. ^ a b c Jennings, George Henry (1881). An Anecdotal History of the British Parliament: From the Earliest Periods to the Present Time. With Notices of Eminent Parliamentary Men, and Examples of Their Oratory. D. Appleton. p. 429. Retrieved 30 September 2015. ^ a b Government of Canada. "Speech From the Throne". Queen's Printer for Canada. Archived from the original on 19 October 2013. Retrieved 20 September 2015. ^ House of Lords Library (9 November 2007). "Parliament Home Page > Frequently Asked Questions > State Opening". Queen's Printer. Archived from the original on 2 May 2009. Retrieved 2 December 2009. ^ Library of Parliament. "Opening of a Parliament and a Session". House of Commons Procedure and Practice (2 ed.). Queen's Printer for Canada. Retrieved 19 September 2015. ^ Parliament of the United Kingdom. "About Parliament > How Parliament works > Parliamentary occasions > State Opening of Parliament". Queen's Printer. Retrieved 13 September 2010. ^ National Museum of Australia. "Exhibitions > Past exhibitions > Royal Romance > Crowns and gowns". Queen's Printer for Australia. Retrieved 2 December 2009. ^ "Allocution d'ouverture". Journal des débats. National Assembly of Quebec. 44 (2): 15–16. 21 May 2014. ^ "McLeish unveils legislative plans". BBC. 5 September 2009. Retrieved 19 November 2009. ^ "Page with 'Stop Harper' sign fired from Senate". CTV News. 3 June 2011. Archived from the original on 6 June 2011. Retrieved 5 June 2011. ^ a b "39th Parliament, 2nd Session". Hansard. Ottawa: Queen's Printer for Canada (001). 16 October 2007. 2000. Retrieved 2 December 2009. ^ a b "Debates of the Senate, 2nd Session, 39th Parliament". Hansard. Ottawa: Queen's Printer for Canada. 144 (1). 16 October 2007. Retrieved 2 December 2009. ^ "The Parliament of the Commonwealth of Australia, House of Representatives Votes and Proceedings" (PDF). Hansard. Canberra: Queen's Printer for Australia (1). 12 February 2008. Retrieved 2 December 2009. ^ "Daily debates". Hansard. Wellington: Queen's Printer. 651: 7. 9 December 2008. Retrieved 2 December 2009. ^ "Prinsjesdag". Dutch Royal House. Retrieved 23 June 2017. ^ "Route of the Golden Coach". Dutch Royal House. Retrieved 23 June 2017. ^ "Joint session". Dutch Royal House. Retrieved 23 June 2017. ^ "Origins and history". Dutch Royal House. Retrieved 4 July 2017. ^ "Opening of the Storting". Norwegian Royal Court. Retrieved 23 June 2017. ^ a b c "The formal State Opening of the Storting". Stortinget. 2 September 2016. Retrieved 23 June 2017. ^ a b c "The State Opening of the Storting". Stortinget. 1 October 2015. Retrieved 7 July 2017. ^ "Parliament opens with full formality". www.newsinenglish.no. 3 October 2016. Retrieved 7 July 2017. ^ Riksdag. "Programme for the opening of the 2007/08 Riksdag session". Hedman, Karin. Retrieved 3 December 2009. ^ McLaren, Walter Wallace (2007). A Political History of Japan During the Meiji Era, 1867-1912. Read Books. p. 361. ISBN 978-1-4067-4539-9. Wikimedia Commons has media related to Speeches from the Throne.